Phoenix Analysis and Design Technologies (PADT) is having a Nerdtoberfest party on October 26 from 5-8 p.m. at the company’s headquarters at ASU Research Park in Tempe. It promises to be a good time! The purpose of the event is to celebrate engineers and manufacturers in Arizona. Nerdtoberfest will feature many opportunities to network and have fun with other leaders of the Arizona tech community. Past PADT open houses in October have averaged over 250 attendees from the high-tech community. 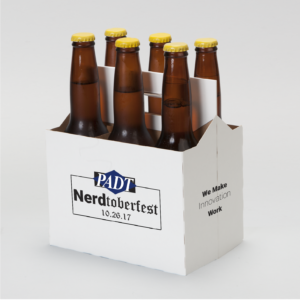 This year, they have changed the name to Nerdtoberfest and have expanded the number of people invited to celebrate recent growth and success. Join PADT as they open our doors to the public for a celebration of all things engineering and manufacturing in Arizona.